NORCO – Car window tinting is one of the best ways to improve the look and comfort of your vehicle. You can protect the interior of the vehicle from sun damage by tinting the windows. Sunlight and heat can cause your interior, like seats and the dashboard, to fade, crack and deteriorate. Window tinting reduces the sunlight allowed into the vehicle, which in turn reduces how hot it gets inside your car. Likewise, homes and offices heat up during the day, and trying to keep your air-conditioner ahead of the game can be costly. 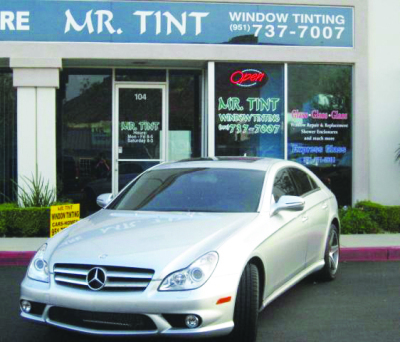 Mr. Tint is conveniently located just minutes from Eastvale at 1780 Town and Country Drive, #104, in Norco (near the post office and DMV). Call them at (951) 737-7007 for more information, or visit their website at http://www.mrtint-ie.com. See their ad on page 5 of the Eastvale News.